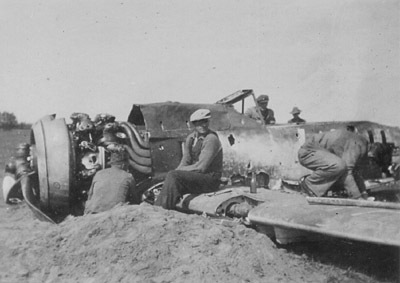 FW 190A-8/R1 emergency landed near Brande 5/5 1945. FW 190F-8/R1 emergency landed near Brande 5/5 1945. The aircraft belonged to I./ SG 151 ? and was coded Weisse 44. T/o Grove ? Op: Flight back home to Germany ? Two aircrafts approached Grarup outside Brande from the north when one of these apparently got problems and belly landed the FW 190 at approx. 08:00 hrs. The landing became a bit bumpy as the chosen field had a ditch crossing it. The pilot hit his head on the instrument panel and passed out. The other aircraft circled the area a couple of times and then continued towards south. Mathias Mathiasen who lived on a farm just east of the field ran over to the aircraft and got the pilot out of the FW 190. When the pilot came to again, Mathias took him to the farm. When the pilot was settled in the house, he complained about his private belongings that was still in the plane. The daughter and daughter in law of the house was instructed where to find his belongings and walked over to the FW 190. The items should be found in a bag behind a panel on the left had side of the fuselage aft of the cockpit. When they reached the aircraft, a number of Danes was already there and the bag had disappeared. When they told the pilot about it, he was sorry because there had been some personal papers in the back as well a dagger of honour presented to him when he had flown against the Russians in Finland. Detective Constable Hougaard who was the head of the resistance movement in Brande was called for and he conficiscated the pilots pistol and called the German garrison in Brande and asked them to pick the pilot up. What happened to him afterwards is not known. 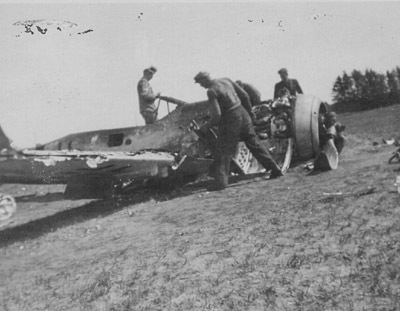 The FW 190 was left in the field until summer. And quite a few local people liberated parts from it before it was finally scrapped. Sources: Newspaper: Vejle Amts Folkeblad 6/5-45, Maciej Goralczyk.